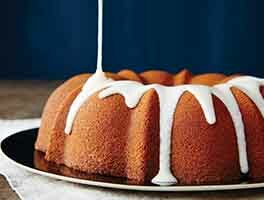 Soft and compellingly spongy in texture, this moist Bundt combines the flavors of olive oil and almond for a touch of sophistication. Serve it plain alongside a cup of tea or coffee; or pile slices with juicy summer strawberries and a dollop of whipped cream or ice cream for an elegant version of shortcake. Preheat the oven to 325°F. 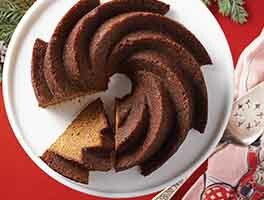 Grease a standard (10- to 12-cup) Bundt pan. In a large mixing bowl, beat together the eggs and sugar until very light and pale yellow, about 3 minutes. Add the olive oil and extracts and beat until incorporated. In a separate bowl combine the flours, salt, and baking powder. Add the dry ingredients to the liquid mixture alternately with the milk, starting and ending with the dry ingredients. Stir until smooth. Bake the cake for 45 to 50 minutes, until a tester inserted in the center comes out clean, and the edges pull away from the pan. Remove the cake from the oven, and place it on a rack to cool. Turn it out of the pan onto a rack after about 10 minutes to cool completely. If turning out Bundt cakes is troubling for you, dust the inside of your greased pan with almond flour before adding the batter. The texture and color were good, almost like a sponge cake but finer. I didn't use the almond extract. I would cut back maybe 10% on the sugar next time. Very easy to make. Will give more feedback next time. I have made this cake three times, and it is a simple and beautiful recipe. It reminds me of the little olive oil muffins called "madalenas" that are served for breakfast in Spain. With the addition of some orange, it would be even more similar. Not too sweet, just different enough to stand out! 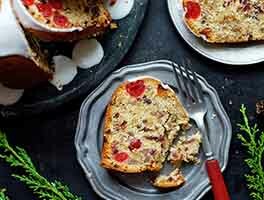 This is an easy cake to prepare for guests?? Its not to sweet and pairs well with strawberries on the side. It went over well with Italian guests.....so I would say thats a good thing. Also excellent in AM with coffee! I made this cake using the almond flour, extract and vanilla, and extra virgin olive oil. Flavor and texture was ok. 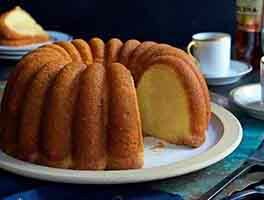 I've made an olive oil bundt cake from a gourmet vegetarian cookbook and it was awesome - I added fiori di sicila with the vanilla - it was soft, firm and you could taste a hint of the olive oil, along with the citrus of the fiori. I think the almond, though very light flavor, overshadowed the olive oil. It would probably have been better without the almond, for a true olive oil cake. But, still, it came out very light tasting and is a good cake; however, I don't think I'll be making this one again. This recipe is a winner. Made it yesterday for a party where it was a big hit. Was disappointed there was only one little slice left over, so am going to have to make again. Wanted a orange flavor so added a little orange oil and grated orange peel to the batter. The cake was light and moist and went great with berries and whipped cream. I like the flavor, but a bit less almond taste than I thought. My trouble was getting it out of the bundt pan. I sprayed with PAM and liberally floured the inside, let the cake cool 10 minutes, ran an offset spatula to loosen from the sides, and a chunk still stuck in the pan. I would suggest using a simple pan, one with out a lot of design details. Maybe an angel food pan. Next time I might try to make it in a flat 13X9. 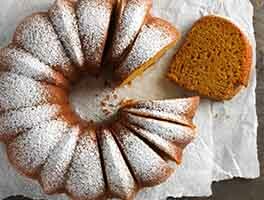 I decided to try this bundt cake recipe with canola oil instead of olive oil because I was not sure that I would like the olive oil in the cake. I used all other ingredients as given in the recipe. The cake came out very moist and I loved the mild almond flavor of the cake. It was perfect. I would definitely make it again the same way. I made this in an 8x8 pan, substituting coconut extract for the almond extract and coconut flour for the almond flour. It was fantastic. Question: If I choose to display the recipe by ounces instead of volume, am I seeing weight or fluid ounces for the olive oil and milk? I prefer to measure dry ingredients by weight, liquids by volume, but in this case it's not quite clear which is which. 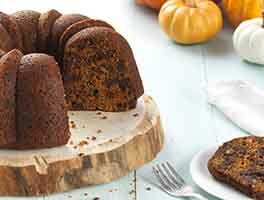 Very easy, moist and delicious. My family loved this cake! I tried orange flavored olive oil which gave the cake a lovely taste- though I think that extra virgin olive oil and orange extract would work just as well.